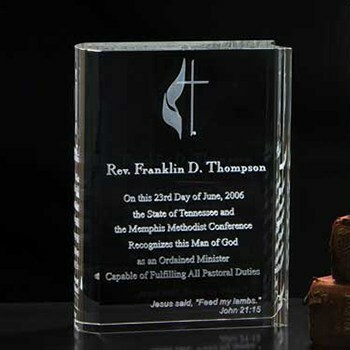 A perfect design for celebrating academic or religious achievements, this is the award to use when you want to tell the recipient that "they wrote the book" with their accomplishments! Of course, this beautiful piece comes with its own padded and blue satin lined gift box at no additional charge! A one-time price of $83.25 will be added to your order.